Julie Otsuka’s The Buddha in the Attic is extraordinary. I’ve read nothing quite like it. It’s a novel that reads like a short history (130 pages) and a free-form poem. The characters are not particular individuals, but rather the Japanese American community and white America. The time frame is from the turn of the century until 1943, when Japanese Americans were rounded up and sent to internment camps. In all my years as a reader, I can think of only two novels made me truly cry: Tolstoy’s War and Peace and J.K. Rowling’s Deathly Hallows. 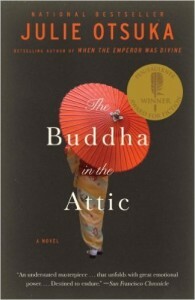 Julie Otsuka’s The Buddha in the Attic has joined the list. Let’s start by saying that Julie Otsuka is an absolute marvel of a writer. The story she tells is rooted in the history of 20th century Japanese immigration to California and the experience of that generation and their children. Otsuka is meticulous with historical detail, which she provides in abundance. In her acknowledgements, she provides a lengthy list of the materials she consulted to inform her novel. The story unfolds in chronological order from the female perspective. The first chapter shows young Japanese women on a boat to California, going to marry men they’ve never met but with whom they have corresponded. Then comes the arrival in California and the reality of this new life with a man who is not what they expected, hard work, then childbirth, continued work, raising children in an alien culture, trying to assimilate, learning to keep a low profile, and finally, the round up and shipment out of California. Some of us …were from Kyoto, and were delicate and fair, and had lived our entire lives in darkened rooms at the back of the house. Some of us were from Nara, and prayed to our ancestors three times a day, and swore we could still hear the temple bells ringing. Some of use were farmers’ daughters from Yamaguchi with thick wrists and broad shoulders who had never gone to bed after nine. Some of us were from a small mountain hamlet in Yamanashi and had only recently seen our first train. Some of us were from Tokyo, and had seen everything, and spoke beautiful Japanese, and did not mix much with any of the others. We were taking over their cauliflower industry, We had taken over their spinach industry. We had a monopoly on their strawberry industry and had cornered their market on beans. We were an unbeatable, unstoppable economic machine and if our progress was not checked the entire western United States would soon become the next Asiatic outpost and colony. Some of us left weeping. And some of us left singing. One of us left with her hand held over her mouth and hysterically laughing. A few of us were drunk. Others of us left quietly, with heads bowed, embarrassed and ashamed…. Most of us left speaking only English, so as not to anger the crowds that had gathered to watch us go. Many of us had lost everything and left saying nothing at all. All of us left wearing white numbered identification tags tied to our collars and lapels. The final chapter is told from the white American point of view and demonstrates a sort of “white privilege” obliviousness that should serve as a lesson to us all. Some are glad to be rid of their Japanese neighbors who made them feel “uneasy,” and, as they purchase exotic items from the Far East in pawn shops and second hand stores, they prefer not to think about how those items got there. Others miss their neighbors, worry about them, pray for them, but over the course of a year, it becomes harder to remember them. All traces that the Japanese lived among them are gone. The Buddha in the Attic is perhaps the most creative novel that I’ve read both in its form and its content. Small wonder that it won the PEN/Faulkner Award and was nominated for the National Book Award. This is the sort of novel that you wish everyone would read — students, legislators, presidential candidates. But the sad fact is that some people are so damn dumb and hateful and fearful that even this exquisitely written novel wouldn’t be able to pierce their invincible ignorance. Still, even those of us who “mean well” are screwing it up if we aren’t paying attention to who is missing from the table, who is not included, whose voice is not being heard. This novel is a timely reminder of that. If I could, I would give The Buddha in the Attic 10 stars, but I’ll have to settle for five. Share the post "Pointillism in the Form of a Novel"
Oooo this sounds beautiful! Onto the list it goes! Great review! You made me excited to read this book, although it’s such a sad topic I’m close to tears just at this point. I live in Japan and, sadly, I think there is very, very little awareness of what Japanese-Americans went through during the war, much less all of the difficulties and racism Japanese faced immigrating to the US and South America. That looks like a good book. Otsuka’s first novel deals with the internment camps. I like seeing these novels pitched toward young readers. It sounds like a beautiful book. Sounds wonderful! Definitely adding to my TBR list! This sounds amazing. I’ve been wanting to read more on this subject since I read “The Japanese Lover.” This isn’t exactly what I had in mind (I was thinking non-fiction), but this sounds too good to pass up.